I wrote to Jason Gray, who has Grey Area Farms out east of here in El Paso County. So I send it along with loving thoughts ~ and I hope it helps Boomer! Luv ya! “Yes, please do send it along to Linda with our compliments and healing thoughts towards Boomer. Boomer is doing ever so much better! Sammy stays with Boomer all the time. A kitty and his dog. He is walking around, even walking out to the chicken house with me. But not always, but I figure any willing to move action is good. And his tail is waggles in greeting! Which I adore. 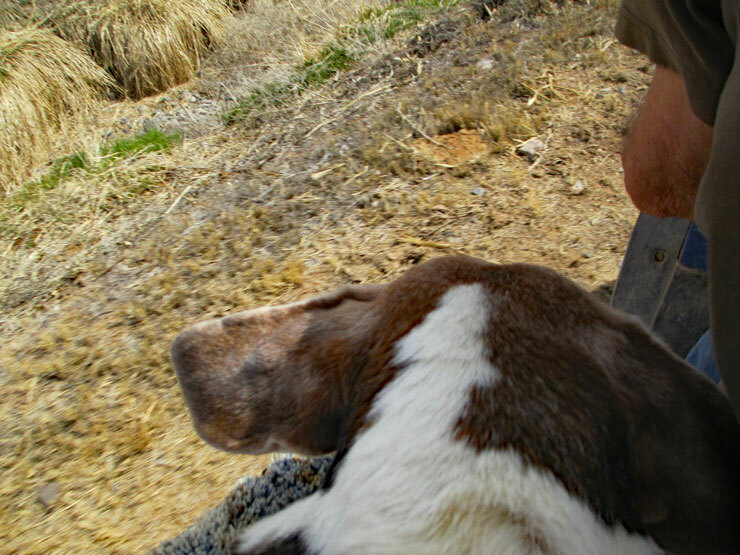 As the setting sun shivered gold across the fields, Boomer asked to go with us to change water last night. I always look at that as a good sign! So….once more I want to thank each and everyone of you! When winter touched our lives, you held us in your thoughts and prayers. That is a huge deal. Your light shown in the darkness giving me hope. In turn I was able to give Beaglie hope. Please don’t laugh. Hope is a mighty thing…and I thank you for it. This entry was posted in Life on a Colorado Farm and tagged 2017, Beagle, Boomer, healing, In the Presence of Extraordinary People---Tuesday, July 4TH, life on a Colorado farm, rainbows by Dayphoto. Bookmark the permalink. Will keep on holding the good thoughts for Boomer. He is such a good dog. He is…as are all our pets! Happy 4th and Happy Birthday, Marianne! Wonderful news, Linda and Boomer! Isn’t it amazing how our animals know when another is sick. Sammy and Boomer are great friends, and it shows. Please give those two a hug from us, and you, too Linda. Loving thoughts. Thank you, Emily! I will. I hope your 4th is a good one! Good news… There are many extraordinary people in the world, and some of them go on four legs instead of two. Glad your little guy is on the mend. I am sure hopeful he is! Thank you, Kate! Hope is everything. Sounds like there are good signs all around. But we’ll keep hoping until you get the all clear. x p.s. that rainbow is INCREDIBLE…well, also, the clouds on top of it. Never seen anything like it. Absolutely! Hope is a VERY mighty thing. Mom and I are not even surprised that Boomer is making good progress. We always knew he would – from our very first prayer – which gave us hope. Stay strong, buddy. Stay brave, Linda. Thank you, Cupcake and Genevieve! I hope your 4th is a good one! I think these are all good signs for Boomer. ❤️ I hope he continues to get better and loses the cough. I’m glad to hear that Boomer is getting better and that you (and Sammy) are keeping him company as he recovers. I sure hope so! I feel we have made the corner! Happy 4th, George! We are sooooo GLAD to hear the good news!!!! We will keep up the prayers. You all and the pets are such a bright spot in our lives. Thanks to all of you!! Prayers still going out for everyone. Please don’t take the time and energy to reply. Spend it on your family. Finally I have a little space. Boomer is able to rest without me…which is a good thing! Thank you so much! OH! Thank you so much Asta! Thank you. I got the Gatoraide and it seems to be stopping the coughing, or easing it anyway! Thank you for the suggestion! Hang in there Linda and we’ll keep on praying for Boomer to get much, much, much, better! He’s got a lot of livin’ to do yet!!! I hope so also! More adventures and stuff to smell and to see. Thank you. He ate breakfast…two days in a row. YAY! Thank you. He slept most of the night without coughing and HUGE step! Gradual steps daily. Rainbows are so full of hope!